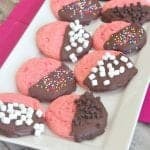 My Chocolate Covered Strawberry Cake Cookies make the perfect simple cake mix cookies for your family and friends! 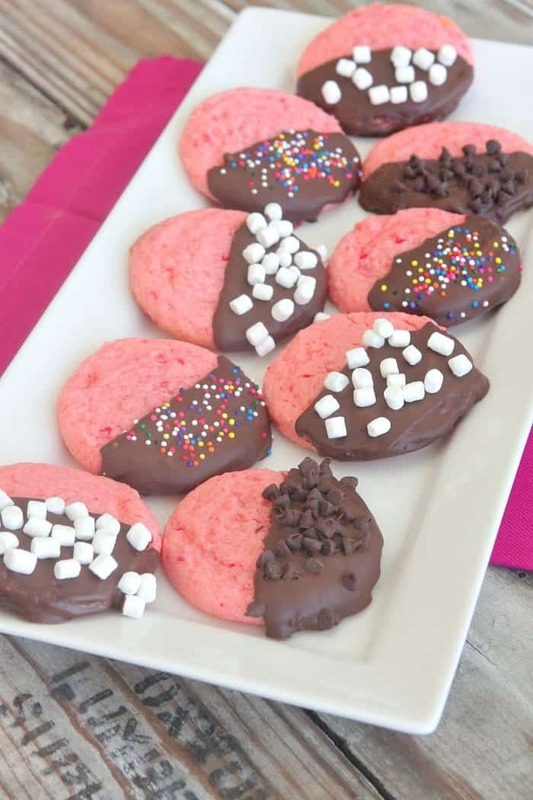 These bright pretty pink cake mix cookies are a party favorite. The fun part is, you can top these with your favorite sweet toppings, pretzels and nuts are great too. Get the kids involved, they’ll love helping! Enjoy! A new recipe video for you today! Take a peek at how simple these cookies are to prepare! Be sure to follow me on YouTube for more videos this year! *This is a great recipe to have the kids help out. Simple and fun for the whole family. *Store leftovers in an airtight container for 3-5 days, room temperature. Place cake mix, butter, egg and oil into a large mixing bowl. Stir until dough forms. Scoop onto prepared baking sheet, 1 inch apart. Bake for 12-14 minutes, until baked through. Remove and let cool completely. 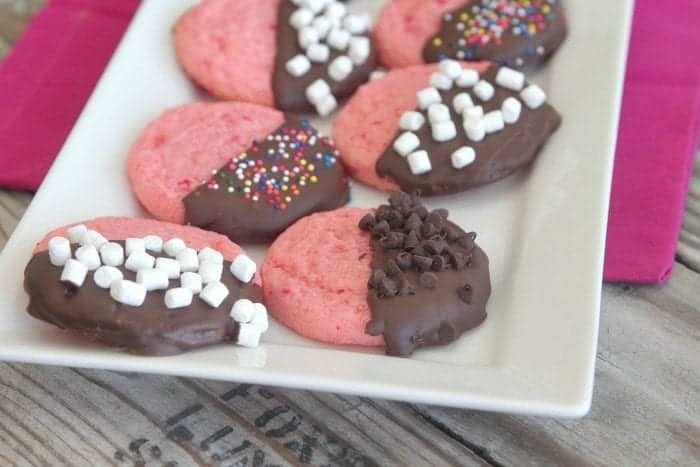 Dip half of cooled cookies into melted chocolate then top with sprinkles or other toppings of choice. These cookies look fantastic! Yum! These look great and I know my boys would love to help me decorate them! These are SO CUTE! Where did you get the mini marshmallows? I have not seen them in my grocery store and I must have them. These are so cute and sound delicious. I love the strawberry/chocolate combination. My coworkers may be getting a surprise treat soon. great sweet treat for friends and family! A new recipe video for you today! Yeh!